The Happy Camper offers a huge variety of recreational cannabis products in our Colorado dispensaries and we produce award-winning concentrates that are sold across the state. But we’re not just focused on making sales; our real passion is cultivating lasting and meaningful relationships with the wonderful people we do business with. The Happy Camper is not an “in and out” shop; it’s an experience. Our knowledgeable and friendly staff strives to inspire and educate our customers every time they set foot in our warm, inviting dispensary. We appeal to a broad range of consumers, and specifically cater to the cycling, hiking, camping and rafting communities. While our target market consists of folks who love being outside, we have a little something for everyone! 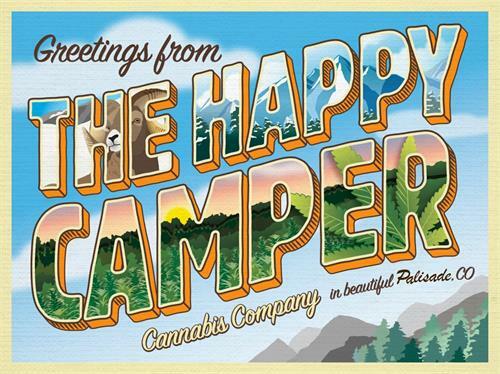 The Happy Camper opened its first dispensary in beautiful Bailey, Colorado in 2015 and a new dispensary is scheduled to open in Palisade, Colorado in 2018. Our dispensaries operate in full compliance with Ballot Amendment 20 in cooperation with the Colorado Marijuana Enforcement Division. Positions available: - Manager - Asst. Manager - BudtendersMust be 21+ **Industry experience a plus**If you haven't already, please send your Cover Letter, Resume, and copy of your Support Badge to info@thcbailey.com If you have already submitted your resume, expect a call from us soon. We will reach out to schedule interviews starting April 29th. Grand Opening date TBD.... Stay tuned! From Denver take I-70 W to exit 44 toward US-6 W, Palisade. Keep left onto Highway 6 and 24. Continue onto Highway 6 and 24. Turn right onto N River Rd and arrive at The Happy Camper.